Hey! You Gonna Eat or What? No, I'm not asking a question. 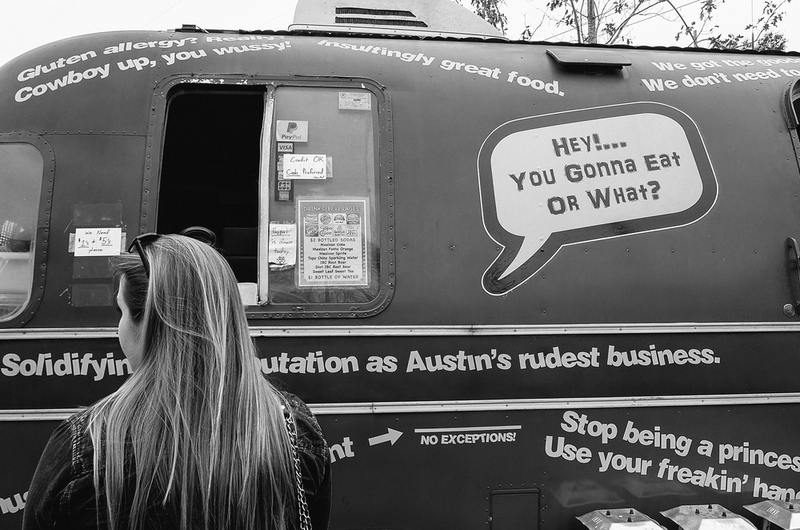 That's really the name of one of the food trucks parked at The Picnic trailer food court in Austin. I was downtown running errands recently and decided to check out the Hey! You Gonna Eat or What? bus that I'd heard good things about. With a reputation for rudeness and a short menu of artery clogging fried cuisine, I wasn't sure about this at first. Well, I was pleasantly surprised. I'd heard the Monte Cristo is amazing so I ordered that from a surprisingly friendly and chatty guy at the window. If the warnings on the bus were any indication, I was expecting to be yelled at by an disgruntled musician running on 3 hours sleep after a dive bar gig on 6th. Maybe they only yell at tourists and hipsters. Another surprise was that owner and chef Eric personally delivers your food to your picnic table, dressed in kitchen attire like you'd expect to see in a ritzy steak house. Between the line and the queue of orders ahead of me, it took over half an hour for Eric to deliver my plate of fried goodness. He explained the details of my order's ingredients and preparation like a waiter serving a fine wine. Was it worth the wait? Heck yeah it was! Sorry, I didn't take a photo of my lunch. I'm not that guy. Go get your own. You gonna eat it or take pictures of it?